Tony Parker is starting to get the recognition he deserves. He has made four all star games, finished in the top 10 in MVP voting three times, and won the 2007 NBA Finals MVP. But he still is not quite rated with the top point guards in the league. He most certainly should be. 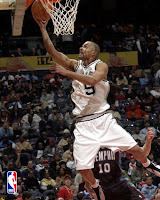 I rated Parker as the 7th best player in 2008, the first year we made the top ten list and the 6th best in 2009. He had a down year due to injury in 2010 and it has taken him until this year (forthcoming) to crack my top ten list once again. But few people have agreed with my high ranking of Parker throughout the years. In 2008, when I said Parker would be the fifth player in the entire NBA I'd choose to start a franchise, I was criticized by friends because they said he was too old. They didn't believe me when I told them he was only 25 years old. That is Parker in a nutshell. For the past five years he has possessed the perfect combination of experience and youth. But people always think he's older than he actually is. There are a number of other misconceptions about Parker. Parker is the best finishing point guard around the basket in the league. Most consider Rose, Westbrook, or Rondo as such and rarely do you hear Parker even mentioned with them. Those three have highlight finishes whereas Parker tends to utilize his elegant floaters around the cup. But make no mistake, the ease and grace with which he enters the lane and the frequency with which he scores around the basket cannot be matched by any point guard in today's game. Parker is the most efficient of the great point guards in the league. Parker has four seasons shooting over 50% in his career. Take Rondo (2), Williams (1), Paul (1), Rose, and Westbrook, who have a combined four seasons of shooting over 50% from the field. Parker leads these players in career field goal percentage and averages fewer turnovers per game than all of them except Paul (they average the same number). Parker is at least as good as Rondo at understanding the pace of the game, though he's never mentioned in that vain. Parker knows when it's time to run and when it's time to slow things down. He knows when he needs to score (as during the entire 2008-09 campaign when he averaged 22 ppg) and when he needs to get others involved. His assist numbers are lower than some of the other star point guards because, simply put, he doesn't hog the ball in the same fashion. If the NBA counted assists as they do in the NHL, Parker would surely be the only man of the six mentioned above whose averages would get a big jump. In the playoffs, his scoring numbers rise, as he takes on more responsibility. He has averaged over 20 ppg in four postseasons, including averaging 28.6 in the '09 playoffs when his star teammates were banged up. None of the other five star point guards have averaged as much in a postseason. One reason Parker is underrated is his teammates. Tim Duncan is arguably a top ten player of all time and indisputably a top twenty player of all time. Manu Ginobili is a good player, but in my estimation is given more credit than he deserves partly because of his international success and partly because he plays flashier and makes the highlight reels more often than does Parker. Some even consider Ginobili a better point guard or playmaker than Parker. Parker's assist to turnover ratio however is better than Ginobili's (2.36-1.86). So Parker has been drastically underrated throughout his career. He is easily one of the best point guards of this generation. Right now, I would still rank him behind Paul and a healthy Rose, but ahead of Williams, Westbrook, and Rondo. Hopefully, Parker will take his rightful place and be mentioned with the other great point guards of today.